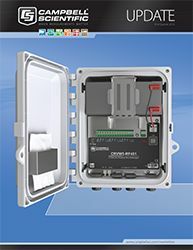 In December 2014, Campbell Scientific released the CRVW3 Vibrating-Wire Datalogger. 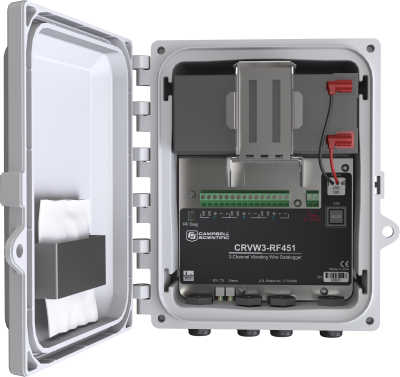 The new CRVW3 consists of a datalogger mounted in a 9-inch-by-9.5-inch enclosure, with either a rechargeable or alkaline battery. Designed exclusively for vibrating-wire measurements, the CRVW3 has three channels for directly connecting vibrating-wire sensors (no interface required). It arrives field ready and is configured to monitor vibrating-wire sensors; no coding by users is needed. An optional internal radio supports wireless routing communication. The CRVW3 uses Campbell Scientific’s patented vibrating-wire spectral-analysis technology (VSPECT) to provide better vibrating-wire measurements. VSPECT greatly reduces signal noise, delivers the highest resolution measurement (less than 0.001 Hz) for vibrating-wire sensors, and provides diagnostic information about the measurements. Vibrating-wire sensors benefit a wide variety of structural, hydrological, and geotechnical applications, and our VSPECT products make better measurements for these applications. The CRVW3 promises to be a valuable new addition to our VSPECT family.